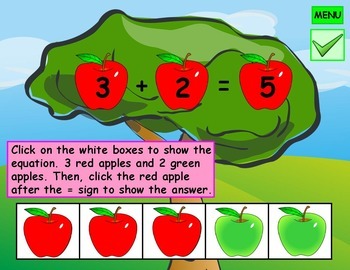 Kindergarten Addition Math: Five Frame Apple Kindergarten Addition is a fun interactive PowerPoint game. In teams, students answer addition equations using the five frame. Once they get a correct answer they are awarded points. The team with the most points wins. There are 5 different game boards for added five frame fun. *Bundle up and save 25%. 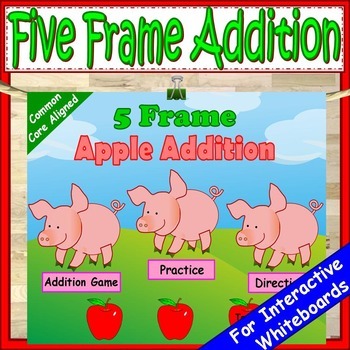 1) Five Frame Addition and Subtraction Bundle for $5.25. 2) PowerPoint Games Growing Bundle for $41.25. This game can be played on any device that has PowerPoint. It is great for SmartBoards, Prometheans, Mimios, or any other interactive whiteboard. This game can also be played on laptops or computers that have PowerPoint. Not sure you can use this game on your device? Download the preview to check if the file is compatible with your device. *Or try downloading the Microsoft PowerPoint Viewer to play this game. 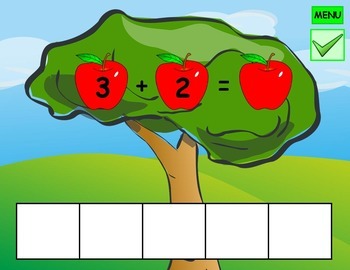 Your students will practice addition. Do you like my products? Click on the green star to start following me. Once you are a follower you'll receive updates on my store. *New lessons added weekly, and are 50% of for the first 24 hours. Feedback: I love hearing from you. Please provide feedback or rate my product. This helps me create better lessons for you in the future. Thank you for purchasing a product at Early Core Learning!